Calgary First Aid is the best provider of safety, food handling, first aid, CPR and AED courses Calgary. This St Mark James training provider has been offering courses to customers in Calgary since 2009. Experienced and professional instructors combined with low prices has made this provider the largest and most popular provider in Calgary, Alberta. Participants can register for a variety of CPR and AED classes including level’s ‘A’, ‘C’ and health care provider CPR (also known as CPR level ‘HCP’). This provider has two main training centres with one located NW of Down-town Calgary and the either located south-east of down-town Calgary. Both training centres offer a variety of courses including food safety, on-line WHMIS, on-line TDG, H2S awareness training, H2S alive courses, standard, emergency, childcare and stand-alone CPR training. Registration for any of the above mentioned courses or a St Mark James CPR and AED course in Calgary can be completed using the contact information posted below. On-line Registration to Calgary First Aid is Available! Click here to register for St Mark James first aid, CPR, and AED programs through Calgary First Aid. 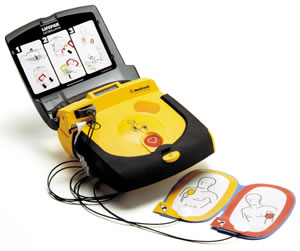 CPR and AED Level “HCP” which offers comprehensive CPR and AED training for health-care providers. Don’t be surprised when taking a CPR course with any St Mark James provider that you are in a room full of people who are enrolled in different training course levels. Trainees registered for level “A” will leave after approximately 3 hours, level “C” after 5 hours, and level “HCP” after 6 hours. Special classes are also offered to individuals or large groups that wish to have their own training course schedule. The main training facility of Calgary First Aid is conveniently located in SW Calgary. Free parking is available by the training center, (neighbouring a park) and public transit access through a C-Train station is directly across the street. The map below provides more details about the training center’s location. Calgary First Aid features the lowest prices on St Mark James first aid, CPR, and AED courses throughout the region. Check out all of the rates below for stand-alone CPR and AED programs. All training courses offer instructional classes in AED usage hand-in-hand with CPR training as part of the BLS guidelines. With Calgary First Aid’s highly qualified and competent staff of trainers and high-end equipment, the education a trainee receives is ensured to be the best. Training courses and stand-alone CPR and AED classes cover topics such as basic first aid in a variety of emergency situations, latest CPR and AED guidelines, food safety, and many more. All the first aid, CPR, and AED instructional classes at Calgary First Aid contain accreditation with the utilization of AED’s (automated external defibrillators). According to the latest Basic Life Support (BLS) guidelines, CPR and AED usage are the necessary steps undertaken after cardiac arrest of a victim has been recognized. Ideally, only a lapse of 3-5 minutes from the intial collapse is allowable before CPR and AED must be done. Trainees who finish their chosen training course are given certificates that are are valid for 3 years and may meet (depending on the course) government, workplace and academic standards for first aid, CPR, and AED use. The previous course must have been completed by a credible first aid and / or CPR and AED provider. The previous award must still be current. The previous award must have been issued in Canada. Please read through the re-certification prerequisites carefully on the Calgary First Aid website to ensure that you meet all the requirements prior to registering. Here’s a head start on your training! Watch the video below for a quick look into what Calgary First Aid can offer you. St Mark James instructor in the video is showing the most recent CPR and AED techniques which will be offered in all the training courses.